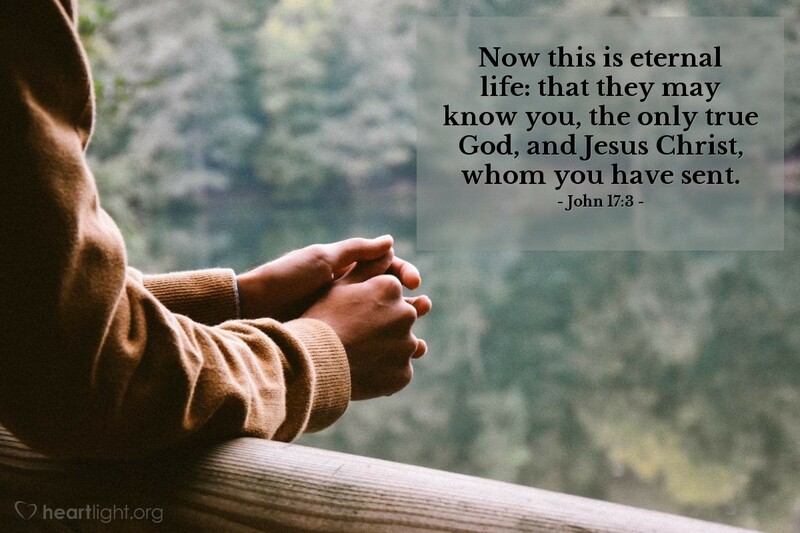 Eternal life begins, now! That is one of Jesus' messages in the Gospel of John. For sure, we don't get to enjoy all of the blessings that await us when we go home to the Father. But, Jesus wants us to know and to experience his love and the Father's presence in our lives, now! He even prayed it for us! So let's seek the Father — not to just know about him, but to know him! He longs to draw near to us and will do so as we draw near to him! He is at work in us, so the real issue isn't his nearness, but our awareness of his presence and work. Let's open our eyes and our hearts to our Father, and ask him to reveal his presence to us! It amazes me, Heavenly Father, that you let me approach you, the Almighty and Holy God. I am humbled by your promise to be at work in my life. Forgive me for the times that I have been so full of myself that I have not acknowledged your presence and grace. Make me more aware of your providential care and your daily presence in me through your Spirit. Open my eyes and heart, dear LORD, that I may know you more fully. In the name of Jesus. Amen.